Here are some examples of how you can build either an online or blended course using the Economics for Life textbooks, supplements and MyEconLab. ECO105Y (course outline) provides intuitive fundamentals for economic literacy without the mathematical details of the major’s course ECO100Y. The classroom component of the course is a traditional two-hour lecture, which is supplemented by rich online resources. This case study highlights how ECO105Y students have a convenient online learning environment that provides all course components—announcements, posted lecture notes, discussion boards, MyEconLab Study Plan problems, eText, digital flash cards, and gradebook. If you look beyond the promotional aspects of the video below, you can get a good sense of how Dynamic Study Modules help students begin to learn material before coming to class. Dynamic Study Modules work by continuously assessing student performance and activity, then using data and analytics to provide personalized content in real-time to reinforce concepts that target each student’s particular strengths and weaknesses. Dynamic Study Modules assess students’ knowledge more granularly than with simple right or wrong answers. 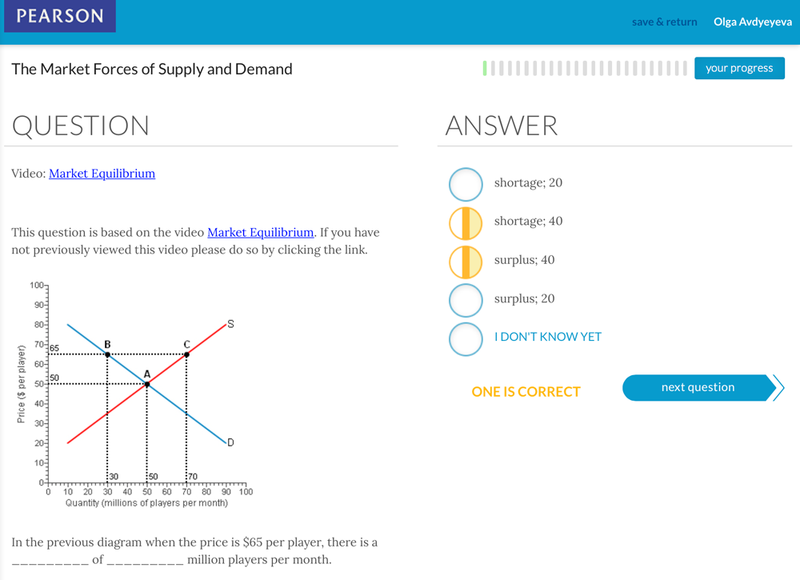 This screen shot examples shows part of a module based on a short video of demand and supply. Students can pick multiple answers, and indicate if they are unsure of an answer or sure. Depending on their answers, the software directs them only to additional content where they need help, while reinforcing their successes. The market for corn is initially in equilibrium. Suppose that the production of biofuels, which use corn as an input, increases, and at the same time, increases in the price of oil cause farm production costs to rise. 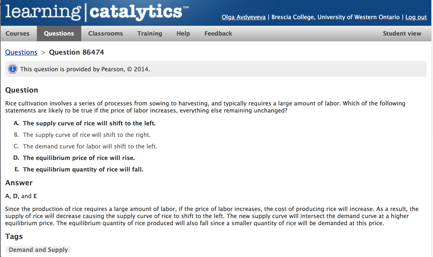 Which of the following explains the effect on equilibrium price and quantity in the corn market? MyEconLab includes Learning Catalytics—an interactive student response tool that uses students’ smartphones, tablets, or laptops. Prompt: Electronics manufacturers can either make iPhone chargers or android chargers. If the price of iPhone chargers decreases, what happens to the supply of iPhone chargers? Answer/Explanation: A change in the price of a good changes the quantity supplied of that good, not the supply. Prompt: Assume new research comes out proving definitively that pizza causes heart disease. Draw any changes on the following supply and demand graph. Answer/Explanation: This is a change in preferences for pizza that would cause demand to decrease. P* would decrease and Q* would decrease. Prompt: Now assume that in addition to new research proving pizza causes heart disease, the cost of cheese decreases. Sketch the changes in the market for pizza on the graph below. 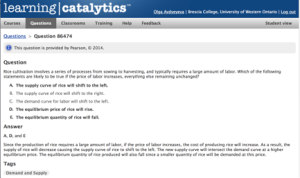 Answer/Explanation: Demand decreases due to a change in preferences and supply increases due to a change in the cost of inputs. The combination of these two shifts leads to an unambiguous decrease in price, but an uncertain change in quantity. By moving some content delivery online, class time can be used for more interactive exercises. Here is an exercise based on a SourceFed YouTube video about rising bacon prices caused by a drought that increased the price of pig feed. 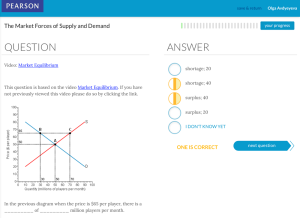 After demonstrating the textbook once-over shifts of demand and of supply (Figures 4.2 – 4.5), play the video and ask students to analyze the story using a demand and supply graph. Start with just the price and quantity axes on the board. Ask students to identify the market (bacon or pork), and describe what happens starting from an initial equilibrium. Besides the decrease in supply due to an increase in input prices, there is also a segment – analyze separately – about how the show Epic Mealtime may have increased preferences for bacon, increasing demand. I have used this video many times, and it always generates laughs, interest, and lots of discussion. The exercise shows students how they can use the demand and supply model to explain real-world events. Through MyEconLab, there are market simulation experiments for a single player or multiplayers.